Cut meat into pieces, salt, add finely chopped onions, pepper, coriander seeds and wine vinegar. Mix them well in an enamel or china bowl and marinate several hours. 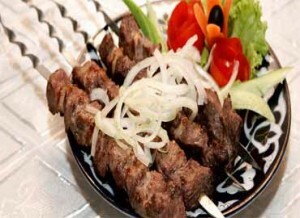 Remove meat only, thread six pieces of meat on skewers (the final piece should be fat) and grill over hot coals.